A long road trip back from Kelowna and we decided to make a stop at this beautiful rest stop. It was winter so the roads weren’t the best in condition, but nothing a Canadian driver couldn’t handle lol. The mountains and all of the forest take more than eight hours to appreciate, but you just got to enjoy the time you get. Kelowna has a wealth of things to do. Art studios to visit, beaches on our beautiful lakes, hiking, boating, camping, luxury accommodation, parks, wineries, theatre, fine dining, on a budget? We can do that too! Great Lake front walkway. You can ride you bike for miles. Awesome shopping and great restaurants. Marina, Casino, Movie Theaters all within walking distance in the downtown area. Art Gallerias and great little coffee ans specialty shops. Beautiful City any time of the year and only 45 minutes to Big White Ski Resort! Superbe ville et la température est magnifique... 30 degré tout le mois de septembre. I guess most people might like Kelowna, it offers a great quiet or party atmosphere with the view of a lake. Kelowna offers a great variety of stuff to do. The beach is for those who want to relax or even play some volleyball. The town is busy on weekends with the night life. There is a lot of good eats. In general the place is a small town with where people with good money can go and relax and sail their boats and enjoy some really good fine dining. It is not so far from the wine central or British Columbia. For me, it was too much like home of Sonoma/Napa area and felt too much like a suburb. But if you like Sonoma/Napa valley then visit Kelowna. This is another pretty place to visit, especially during the summer months when the fruit is in season. The drive from Calgary to Kelowna is beautiful with many spots to stop along the way and enjoy the beautiful mountain scenery and take a picture or two. Davidson Orchard has a lot of mouth watering treats plus the wineries for samples of fine wines. Beautiful, clean, lovely city...the scenery here is unbelievably (beautiful)! Friendly people, nice place to visit, would go again..
Kelowna is a beautiful place in the middle of British Columbia. It is a fun get a way to go camping and with many things to do such at visit wineries, rent mopeds and explore the town. 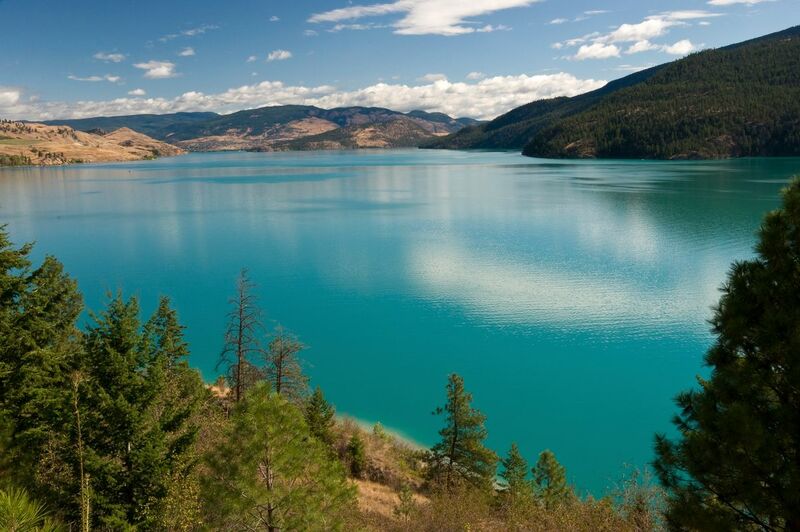 You can go to one of their many beaches and swim in the Okanagan Lake. In the winter you can go skiing at the local mountain Big White. I always seem to have a great time coming up here. Kelowna B.C. another beautiful place, Our son Paul and his lovely wife Mandy were married here, that's where she's from.